Are you finding software can convert PDF to executable flip magazine (exe)? Can I hang a price labeling on my flipping digital catalog? As a product catalog, there must be many products printed on. If each product marked price clearly, it is good for people make wisdom decision whether or not to buy. Flip ShoppingBook Maker specializes in professional catalogue for e-commerce. 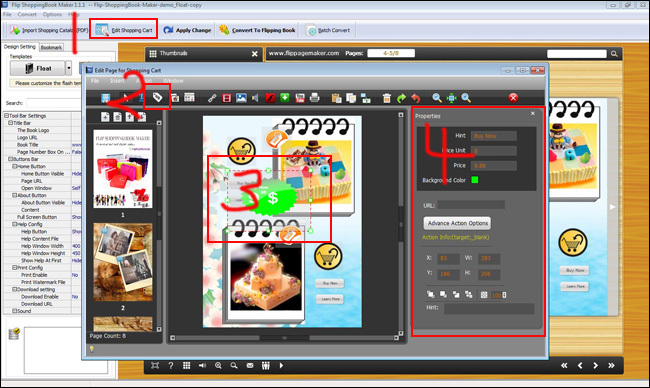 It enables you to label with various dynamic and good-looking price icons. 1 Start Flip ShoppingBook Maker, and then import a PDF file in to edit. 2 Click on the button of Edit Shopping Cart, click on the button of Price. 3 Add a price label on any flipping page, modify Hint, Price Unit, Price, background Color, static URL, etc. Even you can click on the button of Advance Action Options e.g. hitch a hyperlink.